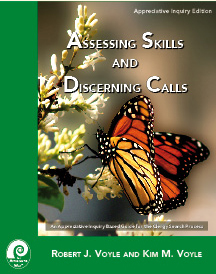 Full Access to Assessing Skills and Discerning Calls. No Clergy Search Consultant Training webinars are scheduled at this time. 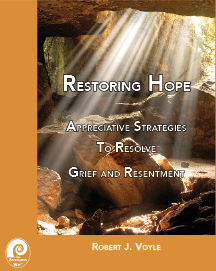 This program is based on the comprehensive 380 page Clergy Search Manual Assessing Skills and Discerning Calls by Rob and Kim Voyle which is their Appreciative Inquiry based approach to the Clergy Search Process. No Pre-Requisite Training: However prior attendance in the Introduction to Appreciative Inquiry (either in-person 2.5 day or online program) would be helpful. What are we as a congregation like at our best and where is our best taking us? What do we want to become as a parish? Once these questions are answered then the focus can turn to the candidates. What are the candidates like at their best? Can we as a congregation provide a context for the pastor to be at their best? Can the pastor provide a context for the congregation to be at their best? Can we together, congregation and pastor, mutually discover God's presence and purpose? Behind these questions is the idea that effective ministry occurs when clergy and congregations create a context that calls forth the best from each other, and within that best to discover the mystery of God's presence, purpose and calling. This appreciative approach contrasts many search processes which ultimately get decided on whether or not each party can tolerate the worst that the other has done and is likely to do. The appreciative approach does not gloss over these problems or flaws but goes beyond them to discern if a positive foundation can be identified to establish a productive ministry relationship. In the secular world of personnel selection Assessment Centers have proven to provide superior information when hiring employees. At the heart of the assessment center approach is a reliance on observing candidates perform specific tasks and simulated work experiences rather than simply relying on traditional approaches such as interviewing or references. They understood they had a purpose or mission to fulfill. They set criteria for effective job performance. They assessed potential candidates with respect to the criteria. From a list of qualified candidates, discern who God is calling to the position. The congregation has little idea of its purpose and what it wants to become. No clear search criteria are agreed upon so the search committee members are simply looking for their individual ideal pastor without regard for the whole. The tasks of assessing skills and discerning calls is confused. Assessing competence is an essential prerequisite to engaging in discernment. It is impossible to effectively engage in discernment when some of the candidates being discerned over do not match the requisite criteria. Course Work: 1.5 hours of recorded online class that is completed prior to the tutorial. Tutorial: Conference call for just-in-time consultation and group exercises. Week 1: Introduction to the Appreciative Way of Understanding Clergy Search Processes. Week 2: How Are You Going to Search? Assessing a congregation's needs and resources to conduct a search. Week 3: Conducting an Appreciative Inquiry Summit to Establish Search Criteria. The power of great questions. Why we don't use surveys. Week 4: Creating a Profile, Setting the Criteria. Converting vision and values into search criteria. Strategies to assess specific competencies. Going beyond interviewing to behavioral assessment. Week 6: The Science and Art of Interviewing. Converting values to interview questions. Converting strategic vision into interview questions. Interviewing for behavioral competency rather than philosophical outlook. Week 7: Discerning a Call. Vestry/Church Board simulation to gather discernment information. Week 8: Designing the Transition. Welcoming the new clergy person and their family. Tutorial time to focus on participants implementation of their search projects. This program qualifies for 25 contact hours of continuing education credit. Clergy engaged in interim ministry. Complete Tuition cost: $495 payable prior to Week 1.